The Teddy Guinea Pig is another breed which is vastly growing in popularity in recent years. One of the most desirable characteristics of the Teddy Guinea Pig is that they are extremely low maintenance compared to other available breeds. This can be attributed to their short fur, which is often rough and wiry. Although you can find Teddy Guinea Pigs that possess softer hair, in general they have a rough and dense coat, similar to that of the Abyssinian Guinea Pig but without the rosettes. They also make quite good pets as they are affectionate and most of the time warm up to people quite quickly, unlike other breeds such as the Rex Guinea Pig. This means that less time is needed to get to know their true nature once you purchase your very own. They are high energy and spend a lot of time being active, in contrast to long haired breeds which can be quite calm and placid. Especially for children, this makes them a desirable choice for small pet. Another defining characteristic of these little fireballs is their upturned nose, often referred to as a “Roman Nose”. They require a significant amount less grooming than most other breeds and are extremely self sufficient. They need minimal grooming, although brushing with a slick brush to remove loose hair and debris would be ideal, as debris lodged in their fur may lead to irritation and infection. Using a wet cloth or tissue to gently rub their ears from time to time will minimise the build up of ear wax that all guinea pig breeds are prone to due to the shape and size of their ears. It seems that Teddy Guinea Pigs also have much drier skin than some other breeds. To ensure that they do not suffer from dry skin it is important to be aware they do not need to be bathed often. For animals living inside, bathing is not necessary as with brushing their fur will stay relatively clean, but outdoor Teddy Guinea Pigs may be bathed no more than 3 times a year. The name ‘Teddy’ originated just where you would have thought, from its likeness to the teddy bear. The fur of the Teddy Guinea Pig is often likened to a teddy bears fur and its upturned nose makes it look even more like the beloved children’s toy. Their personalities can be adventurous and a little challenging at times, but that’s what makes this breed so fun to be around! They are vastly curious and this can sometimes hinder them when it comes to living with humans! Due to their active nature, they must be supplied with lots of toys and other equipment as well as the essentials, like bedding. Once they settle down for the day they do love a good cuddle too! They have the same diet as most other species, loving fresh vegetables, vitamin C pellets and hay as well as a good supply of fresh water. 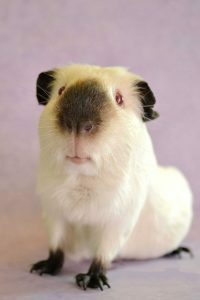 If you are looking for the perfect guinea pig pet, it is hard to bypass the Teddy Guinea Pig! The Texel Guinea Pig truly is one of a kind, and it is often referred to by owners as their favorite breed for countless reasons. This crazy cross between the Rex guinea Pig and Silkie Guinea Pig makes not only a loving pet but also an amazing addition to any guinea pig family. They are quite placid and exude an overall loving and tranquil personality. Just looking at these adorable little guys with their mane of curly locks shows one of the more aesthetic features of these little critters. Their long, curly hair covers their entire body, while the hair on their face remains much shorter, allowing them to see, breathe and eat efficiently. However, although cute and cuddly, the vast amount of hair possessed by the Texel Guinea Pig means that they require quite a lot more specific care than most other breeds we know and love. 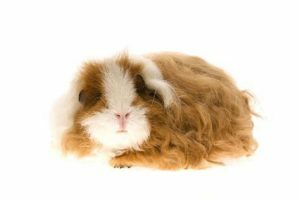 One of the main issues associated with their luscious fur is that Texel Guinea Pigs are prone to getting foreign objects stuck in their hair, which may lead to irritation and infection. Mainly this includes anything from hay and bedding to excrement. This is why this breed requires monotonous care, owners find all the hard work worth while! Texel Guinea Pigs are also prone to ear wax buildup due to their long hair. The ways in which many of these ailments are irradiated is through trimming of the hair on a regular basis. Diet wise, this breed has the same requirements as most others, a combination of hay, vegetables, vitamin C pellets and fresh water are ideal to keep you Texel Guinea Pig happy and healthy on the inside. With most breeds, trimming of hair and nails is recommended, but with the Texel Guinea Pigs it is a necessity. Maintaining good hygiene is of utmost importance as this breed is prone to infections. It is recommended to wash their hair regularly, once a week will be plenty, and this also assists to reduce matting in the long fur. The hair can be safely trimmed with either safety scissors, hair dressing scissors, or for a really accurate cut, an electric shaver. Their thick hair is best brushed with a wire tooth comb, and regular combing will reduce knotting and matting too. When trimming the fur, keep the hair at the back of the Texel Guinea Pig shorter, as this reduces the risk of trapping faeces and urine in the fur and the subsequent infections that may ensue. Texel Guinea Pigs come in a range of colours and markings, all of which set them apart from their short haired counterparts. From browns to blacks and whites, their unique flair makes this breed even more lovable. 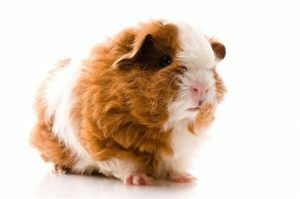 Most owners find that they also have one of the sweetest personalities generally speaking of any guinea pig breed. This may be one of the newest breeds available today, but also one of the most sought after breeds the modern world has to offer. ● The Texel guinea pig has long curly hairs which are longer compared to the Sheltie/ Silkie brand. ● The Texel guinea pig is a result of genetic mutation. It is the product of crossbreeding the long haired Silkie guinea pig and curly coated Rex guinea pig. ● The crossbreeding is thought to have taken place in England in the 1980’s. ● It sits alongside the Teddy guinea pig and Skinny guinea pigs which are part of the newest set of cavy breed. ● As with other guinea pigs, they have good hearing sense. ● The contact abilities and range of smell of the Texel guinea pig is very good. ● They have poor eyesight. ● Their facial hair varies from cavy to cavy based on genetics. ● The average lifespan of the Texel guinea pig is within four to seven years. 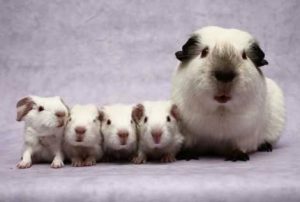 ● The range of the litter size of the Texel guinea pig is about one to six and the average is three. ● It takes a period of 60-70 days or nine to ten weeks for the gestation period of time it takes for a mother to carry a baby inside the womb to occur. ● The babies are born active and have walking abilities at birth. ● The female or sow is more likely to die from diseases when breeding and these chances increases with rise in temperature. ● Small litters poses more danger to the mother as these rodents are bigger in size. Likewise, the life of offspring are at risk from large litters. ● They require much grooming as their rich, thick long coats are the most difficult to manage among other breeds. ● Their body coat needs to be brushed regularly, at least daily to prevent parasites and other items from getting stuck or entangled, it needs to be trimmed or cut at some point. 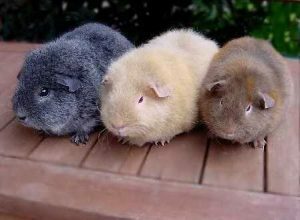 ● When compared to other types of guinea pigs, the Texel guinea pig have short body length. ● The Texel guinea pig has large, wide and round face. ● They do not always have hairs beneath their jawlines and ears. Some do and others don’t. ● They share similar diets with other breeds of guinea pigs. ● They cannot manufacture their own vitamin C, so they external intake of the vitamin by eating leafy vegetables, green and fruits. ● They live in similar cages to other breeds of guinea pigs. ● Soft Shampoos can be used to bathe them to maintain hygiene. ● Satin Texels also exist, these are guinea pigs with denser and shinier covers. Himalayan guinea pigs are relatively easy to take care of. However, one needs a little experience and pay more attention as these pigs need more maintenance. It would be more appropriate to keep this breed of pig in a cage with a shady spot throughout the day as the pig does not like so much exposure to sunlight. The cage should be comfortable and as shady as possible. The color of the Himalayan pig fades when the pig is stressed and exposed to extreme light, therefore, a well-constructed cage is that important.The colored points are very important as changes are indicators of things not right. The cage should have enough space for exercise and play. There should be a small box in the cage where the pig can sleep or hide in. In their cages, you should put beddings preferably hay. These pigs love burrowing in hay and also sleeping in it. It is favorable to keep the Himalayan guinea pig in pairs or more as these pigs really like the company and are very sociable. The pig cage for the Himalayan guinea pig should be kept at high hygienic levels. The cage should be cleaned regularly to ensure all the food remains, and waste products are removed cleaned out and disposed of properly. The Himalayan pig has a short and smooth coat. As part of care for them, the pig coat needs to be brushed severally. Bathing them won’t be necessary as long as you brush the pig regularly. In case the pig is infested with external parasites, it is advisable to bathe the pig with the recommended medicated shampoo. The nails of the Himalayan guinea pig should be clipped severally using clippers. The teeth of the Himalayan guinea pig continue to grow. Their teeth can grow up to very unpleasant levels. To avoid this, the pigs should be provided with a constant supply of chewing materials. The Himalayan guinea pig likes to live in a cool and quiet place. Loud noises and heat waves cause stress to the pigs and also lead to heart attacks. It is highly recommended that the cage for the pigs is constructed in a cool place free from any loud noises. The pigs also should be kept in a condition that causes minimal or no stress to the pigs. Reduced stress also leads to reduced chances of illnesses. The good thing about the Himalayan guinea pigs is that they rarely get sick. However, it is recommended that you perform regular health checkups to avoid development and/or spread of chronic diseases. The health checkups should be performed by a qualified animal officer or a veterinary. It would also be great if you would apply for an insurance cover for your pigs if there is a provider in your country.